This article was written by Adolfo Muñoz Torres, local organiser of the Global Goals Jam Aguascalientes. On September 22 and 23 2018, the Aguascalientes Foundation for Culture, Academy and Sport (FACULTAD, AC), an organization founded in 1998 and certified by the International Youth Federation based in the city of London, England, was host of the First Edition of the Global Goals Jam, and in which 36 people from the academic, private and governmental sectors participated, as well as civil society in general. The background of the Global Goals Jam in Mexico is very recent, since only two cities participated in 2017: Monterrey and Tabasco; In 2018, 4 more cities were added: Mexico City, Guadalajara, Yucatan and, of course, Aguascalientes. While it is true that more and more people speak the English language, the truth is that there are still many who do not master it, so for the celebration of our Jam was essential to have the methodology translated into Spanish, a task that members of Our Foundation carried out with a lot of dedication. It should be noted that we are making available to the organizers of the Global Goals Jam worldwide the methodology in our language, so that in future editions this tool may be available in Spanish mainly for Latin American countries. Well, according to common interests in relation to the ideas that the different participants wished to develop, we formed 6 teams with 6 members each and we began to use the methodology developed by the United Nations Development Program, to build the projects through the 4 design Sprints. During the first day we carried out the first 3 Sprints: Define the problem, Create a solution and Prepare a prototype for that solution. It should be noted that, prior to the formation of the teams, we gave a brief introduction on what is the 2030 Agenda for Sustainable Development, the 17 Sustainable Development Goals and where the Global Goals Jam came from. The experience during the first day was extremely incredible, all the members of the teams were very happy and motivated to see how little by little their ideas were being transformed into high impact projects. The second day we dedicate them to the Prototype Fair and to carry out the Sprint number 4; the participants presented very innovative prototypes and made excellent exhibitions of them. It was time to organize and present each of the projects in just 5 minutes, this was an extraordinary experience for all because they did not think they could summarize in 5 minutes all the work of almost two days. Something that is very important to share is that during the two days that our event lasted, the FACULTAD Foundation, A.C. provided all participants with the necessary food so that they could remain all the time inside the facilities where we made our Jam, and in this case it was the Aula Magna of the Graduate Building of the Technological Institute of Aguascalientes. 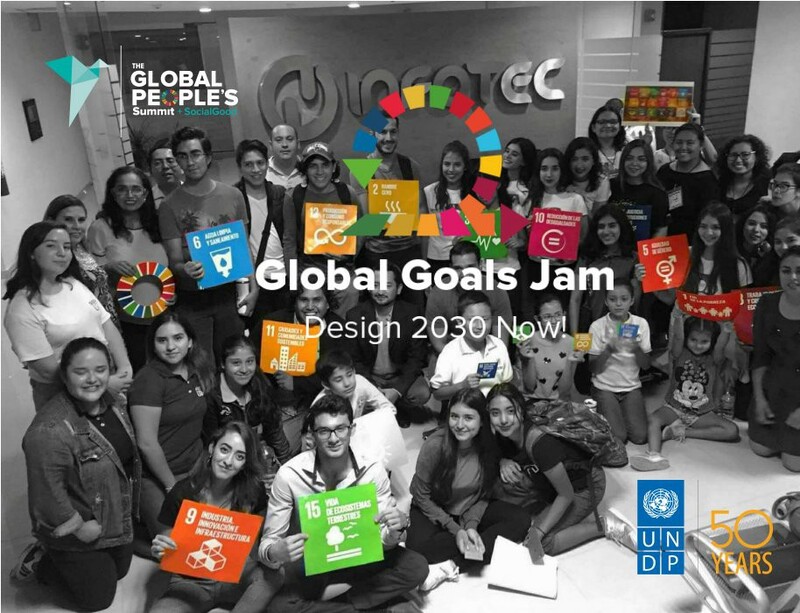 At the end of the development and presentation of the projects, a qualifying jury formed by a group of experts in environmental, economic and social issues, evaluated and appointed two teams as responsible for having designed the best projects of the Global Goals Jam / Aguascalientes 2018. 1) With the project “Locate your consumption”, the COORDENADA team won the first place in our event by seeking economic and sustainable development in the communities, through a digital platform focused on the dissemination of local consumption. 2) The ENERGY ENVIRONMENT team obtained the recognition as the best project designed during our event, by developing an extraordinary idea to minimize the impact produced by man within the energy sector (solar and thermosolar). 3) The team ALLIANCES FOR THE DEVELOPMENT OF SUSTAINABLE COMMUNITIES (ADECS), designed a network that supports projects based on the Sustainable Development Goals, which has principles and values ​​based on the Earth Charter, giving the necessary environmental education and complying with the appropriate guidelines for the responsible use of natural resources; fostering functional ecotechnologies for the conservation of our environment, and complying with environmental laws and regulations. This alliance generates the networks that different organizations need to achieve collaborative work with similar organizations, combined efforts, experience and economic funds to achieve sustainable communities. 4) The COBI FOUNDATION developed a digital inclusion platform aimed at people with disabilities who do not have the same opportunities to study and have a decent job. 5) The GLOBAL SOLUTIONS team designed a project to promote the development of sustainable cities, through the determination of sustainability, sustainable education for all, the creation of collection centers for undocumented immigrants and the creation of temporary jobs for them. 6) The “AGUA TLÁLOC — AGUA PARA TODOS” project starts with harvesting rainwater on an already established surface of 12X24 meters, on school ceilings. The system is very simple and very economical, gutters from C.P.V.C. double channel, charcoal or mineral filter, hermetic tank, pump and direct solar collector without battery. From there it goes to the fillers. This project can have a great impact at a national level, apart from providing clean and quality water for thousands of children and young people; In addition, thousands of PET bottles would be consumed. Finally, I would like to express that having organized the First Edition of the Global Goals Jam in the city of Aguascalientes, Mexico was a unique experience and a great challenge, and that without doubt in 2019 we will climb and perform in a much better way.